9 Simple Steps to Stop Dog Anxiety – ComeHereBoy! Today’s dog anxiety video walks the line of positive training and traditional. The guy here pushes some of the controlling/traditional training, but some of it is just plain good positive advice. This video is forever, but he has some really good information on stopping dog anxiety. Make sure your dog learns to walk on a leash very nicely and always does so. No pulling, lunging, barking, etc. The reason for this is kind of unclear in the video, but I would guess it is because the dog learns to control their energy when things are very stimulating outside. 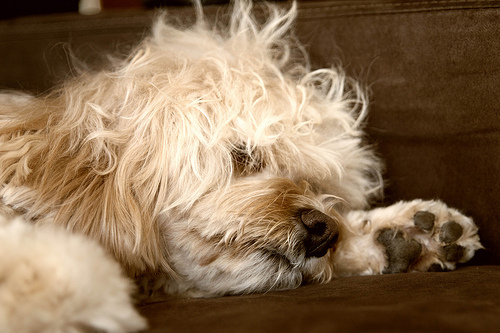 This control can then be transferred to controlling the nervous energy from dog anxiety inside. Teach the dog to go in the kennel on command and come out on command. He doesn’t say this, but I’d add teach the dog that the kennel is safe and there are nice things there (antlers, other treats, a kong, cover it with a sheet if it’s a wire kennel so it’s dark). Teach the dog to stay in there unless told to go somewhere else. Likewise, teach the dog that when he’s not in the kennel, he has a place (a dog pillow) and train him to go and lay there on command unless told to go elsewhere. The guy says if you have a dog with separation anxiety, you need to teach the dog that he doesn’t need to be stuck to your side or in your lap the whole time you’re home and so have him either in the kennel or on the pillow, even when you go to other rooms. I feel like this is really good advice for helping stop dog anxiety. Don’t play with your dog in the house or allow him to run around and do what he wants. The house is not the place for energy and craziness. If the dog gets wound up inside the house, you are encouraging this wound up behavior while you are gone. Inside the house is calm and controlled and peaceful. Outside the house is for playing and crazy. Be calm when you enter and leave the house. No big hellos or goodbyes, because it will get him wound up and create energy around the fact that you were gone. Basically, ignore the dog when you leave or come back. Go do something else before you greet your dog when you come home. Decrease food, verbal and physical praise (when the praise is related stopping the anxiety issues) because it creates more energy around the dog anxiety. I think the key word is decrease here, because I feel there are definitely times when the dog should be praised calmly for his progress. Dog training should be worked on, in a way, all day all the time. It’s not just a one time series of tricks you’re teaching your dog. You need to be consistent and always teaching/controlling your dog.I agree with this somewhat, in that you shouldn’t wait til a problem escalates to address it and you should always be prepared to address something that comes up, but I don’t think your dog always needs to be perfectly poised and performing. Let the dog play and be part of the family still, etc, and once behaviors are learned and trust is built, your dog doesn’t have to be watched/controlled at all times. Just make sure that you don’t let the dog get away with things sometimes and other times punish them for it. Don’t ask your dog if they want to do things and get them all excited to go out the door for any reason. If you have a dog with energy and anxiety, this will create a bunch of crazy energy focused around going out the door with you… and then a… well… disappointment or sense of “I want to go out and have fun too!”, whine whine, come back and get me, when you leave without them. Train your dog to run on a treadmill. If you don’t have time to take your dog for long runs or bike rides to get their energy out, consider getting a treadmill and having your dog run on it while you get ready in the mornings. It’s great, focused, calm exercise for the dog that doesn’t get them crazy excited like fetch does. 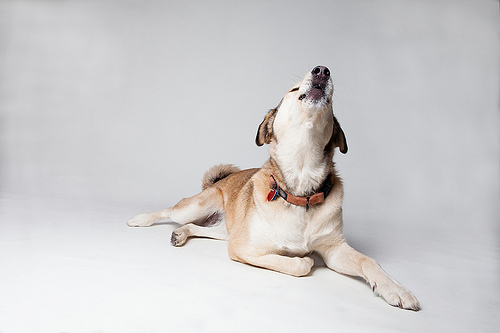 Use a remote bark collar instead of a citronella collar for barking behavior while you’re gone. This is something I don’t agree with, but he says bark collars are more humane than citronella because citronella sprays right in a dogs nose and eyes and hangs around for a long time afterward irritating them, so the dog is punished constantly, rather than just once. I don’t agree with this method. I don’t think a dog should be hurt/punished with spray for vocalizing. However, there are bark collars that give out a long annoying tone when your dog barks, so that might be a different distraction that might work. For whining, he says to poke the dog, but I’m skeptical of that working very well or being very nice. Maybe try putting barking/whining on command and give them a “quiet” command before you leave. It may also help if you have chew stuff in their kennel to keep their mouths busy. My dislike of this also has to do with it being a behavior that disappears if you take the bark collar off/aren’t there, so the dog is conditioned to not bark if the bark collar is on or you’re in the room. It would also be nicer to train this to not happen without a bark collar… that’s hard when you’re not there though. You could try the method of attaching a leash to the kennel and pretending you’ve left, hold the leash around the corner and wait for the dog to bark, then pull on the leash to shift the kennel. That can distract the dog out of barking, but is not a method I have personally tried. He also mentions using the Pet Convincer to blow compressed air at the dog when they’re barking or whining to reset them. The dog looks a bit frightened by that thing though too, so I don’t really like it either. If you have any other ideas, let me know in the comments… barking while you’re gone is a tough one. Sometimes you may have to try these methods though if you’re very desperate and no positive methods have worked, especially if in an apartment where you are in danger of losing the dog. In summary, his video is about keeping calm energy at all times in the house yourself and teaching your dog to control his energy inside and outside the house to stop dog anxiety. 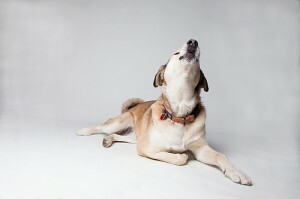 Do you agree or disagree with the idea of using a bark collar to stop dog anxiety barking while you’re gone?